DinoSystem is a 2D ecosystem and survival simulation that allows players to manage the ecology of an evolving island and survive in it as a human, dealing with realistic survival mechanics and a deep character progression system. Very Positive (118) - 88% of the 118 user reviews for this game are positive. “There is no current ETA for the final version, but you can get an idea of the current development stage by checking the game version: for example, v0.70.0 means the game is 70% complete. “There are some core game systems missing, like the God Mode tools, game lore, and more content. The game gets more refined with every update, so it's difficult to be specific on how it will differ when completed: it will be better, rest assure of that! Update v0.85.0 - Character Presets, Controls tweaks, AI expansion, many improvements! This update IS compatible with savegames from previous v0.80.0+! But it's still advised to start a new game, as some changes could potentially cause glitches. - "Absolute" renamed to "Keyboard", which controls the character moving direction with the keyboard input (as before), but now it applies ALSO to the character angle. KEYBOARD is now the default option when the game is first started. - "Relative" renamed to "Mouse", and works the same as before. - Added a new option called "Mixed", which is like "Keyboard", but retains the ability to turn the character with the mouse (same as "Absolute" before this update). - When triggering a melee attack from the Keyboard, the character will automatically turn towards a close-range frontal target (check the survival section for more info about it). - Removed the possibility to bind a key for changing the Control Mode (default was T), as it was unnecessary and could be pressed by mistake, confusing new players. - Presets are pre-defined starting character builds. - Presets are a good starting point to build your character pursuing a specific playstyle. - There are five presets: Default, Survivor, Hunter, Runner and Tanker, each with its pros and cons, and more will probably be added in future updates. - When triggering a melee attack from the Keyboard, the character will automatically turn towards a close-range frontal target (animal or tree) before performing the attack. If attacking from LMB (left mouse) or in Ranged, the attack direction is still fully mouse controlled. - When hitting a target (melee) or when firing a projectile (ranged), the character cannot turn for the duration of the attack delay (red attack bar), preventing him/her from exploiting the turning mechanics and limit/avoid stumbling. - Attack precision and collision detection vastly improved. - Wind impact on projectile trajectory reduced and rebalanced to have a minimum wind power threshold. - It is now possible to hit trees with all weapons (even with the punch!) dealing a small damage to the trunk and potentially chopping down small trees, but doing that without a cutting weapon triggers a hint suggesting to use an Axe/Sharpstone instead. - Animal energy/water/stamina expenses rebalanced. - Number of eggs layed per species rebalanced, and it no longer scales with species population. - Fighting/hunting events outcome rebalanced and made minor tweaks. - Energy/water gained from food rebalanced, and eating action improved. - Triceratops and Ankylosaurs feeding preferenced tweaked to let them occupy slightly differenct ecological niches. - Improved how the game evaluates how well every species is doing, taking into account more parameters. - Removed some artificial balance enforcing mechanics, as they're no longer necessary. - Tweaks to the animals aging system. - Some rebalancing to animals generation at game start. - Predators are now much better at evaluating which animals they should hunt, taking into account more parameters and with less restrictions (previously, they only hunter members of the more numerous species). - T-Rex can now grip and carry away a small carcass, if they see another T-Rex nearby, in order to feast on it alone. - Male Troodon will now stay close to his partner after mating, and help her protect the nest. - Improved how mothers guard their nest. 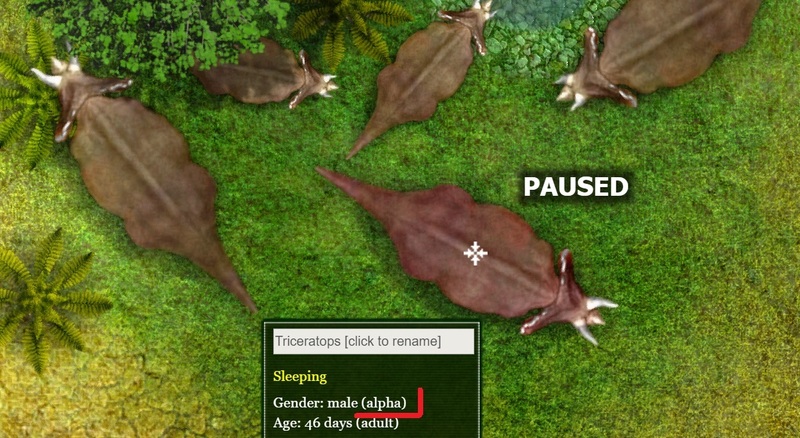 - Triceratops and Troodons now have Alpha male/female, which can lead the pack and take some decisions. - The Alpha specimen is usually the strongest and/or oldest member of the pack. - Triceratops have harsh confrontations to decide who'll become the Alpha male. - The Alpha male/female has slightly more vivid colors. - Animals hibernate in three occasions: when they cannot find/water food and are starving/dehydrated, when their species is close to extinction and they can't find a fertile mate, and during a particularly cold winter (only Troodons). - While hibernating, the ZZZ sleeping icon is red. - While hibernating, Stamina is always 0 and the metabolic functions are slowed down to 1/5, allowing the animal to endure starvation, hydration or lack of fertile mates. - While hibernating, the animal can still be awakened by attacks or other events (receiving a Stamina boost). - If starving/dehydrated during hibernation, the animal has a chance to wake up for some time (receiving a Stamina boost), in order to find what it needs. - When performing certain actions, animals now show a pop-up text next to their head with the action name. - The actions shows are: fleeing, eating/drinking, falling asleep, waking up, mating, laying eggs, winning/losing a fight, and few others. - In Survival mode, the action text is shows with a chance equal to the character Zoology skill. - In God mode, the action text is always shown. - [Survival] Added dynamic mist effect, which is only visible in Survival mode, but depends on actual weather variables. - Clouds effect improved and made more vivid overall (plus more weather visual improvements). - Major optimizations to clouds, cloud reflections and cloud shadows logic. - Asteroid chance decreased by 15% for "Likely", and by 100% for "Unlikely" (which is now REALLY unlikely!). - [Survival] Items are now highlighted when the mouse is over them. - [Survival] Skills at -100% progress now have a chance to decay when the player is exhausted (low Stamina) and when receiving damage (chance based), instead of just instantly decaying when passing out (at 0 Stamina). - [Survival] When performing actions like gathering, drinking and eating while having both hands holding item/s, the character will drop them from the right hand ONLY for the duration of the action and take them back as soon as the action is finished, instead of keeping them on the ground, which forced the player to manually retake them. - Various improvements to the movement system and pathfinding, making animals turn more smoothly and follow their mother/partner/peer more efficiently. - [Survival] Fixed (finally!!) the infamous "permanent auto-walking while drinking" bug (also fixes corrupted saves). - Fixed animals sometimes repeatedly bumping into an obstacle (wall, boulder) while trying to reach a target (like food or prey) which is on the other side of the obstacle. These are only the most relevant changes, as always there are tons of other in this update, check the full changelog for the complete list!